I know, I know. I already recapped our trip. But hear me out. I know when I was planning our trip - the thing I couldn't get enough of were suggestions and recommendations. What people did, where they stayed, how they got around, what they enjoyed and didn't - and of course, the most important - what they ate. My recap was more like an online photo album, which is great for me, but not very helpful. So, I decided to share all our favourite things about Paris. 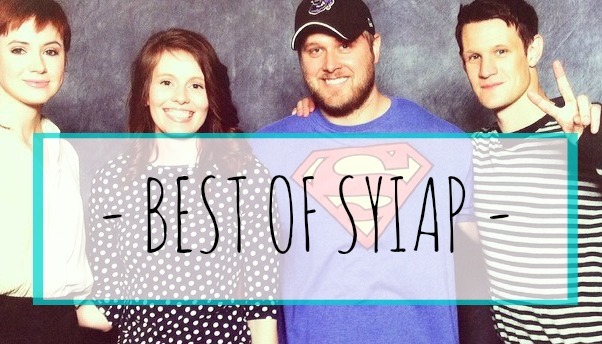 This definitely isn't a comprehensive list, just a few things we really enjoyed and highly recommend. 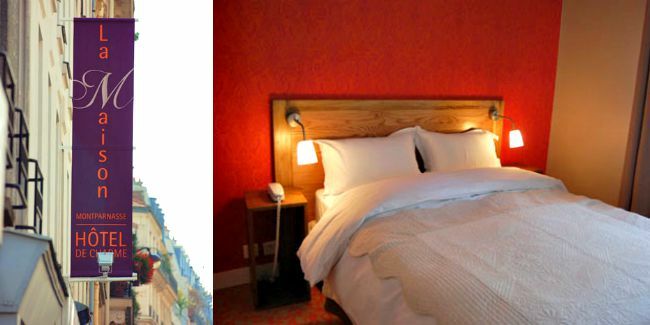 This can hardly be a favourite when it had no competition but we stayed at La Maison Montparnasse which is located in Montparnasse and according to google maps, about 40 minutes walk from the Eiffel Tower. KC and I must be speed demons because it took us like 15, max. It's also really close to the Montparnasse Tower which I highly recommend (more on that below). If you are a hotel diva - it's not for you. But for us? It was in a good, safe and central location, it was clean and cheap. I mean, there was seriously no competition. It also has great reviews. The stairs are a bit colourful, but I think the hotel is adorable and the staff were amazing. Very happy with our choice. I really don't think you can go wrong with a hotel as long as you obsessively research on TripAdvisor. I mentioned before, but I think the best way to see a city is to walk. KC and I walked probably 90% of the time, and the other 10% we used the metro. It is so insanely easy to use, I'm not even kidding. You go up to the machine and you buy a one day ticket (or one trip, depending on what you need) and then you look for the station you need and easy peasy. Seriously. There are signs everywhere and it's honestly the easiest metro system I've ever used, and I have now used the train / metro / subway in 5 different countries, so, you know. I'm an expert. Just kidding. If you do use the metro, download the (free) Paris Metro app - it has a map that you can access offline which is brilliant. As for to and from the airports (we arrived in CDG and left out of Orly) you have a few options. You can take the metro. I was a bit nervous and didn't want to risk getting lost or having to worry about our bags, however, now that I have been and used the metro I would definitely use the metro next time. We bought transfers ahead of time on Viator. This is not a super cheap option, but it was easy and I was able to pay for it beforehand, which is what I like. However. From what I heard from other guests and the hotel staff, the shuttles do not have the best reputation. They are often late, apparently. Our shuttle was late picking us up when we arrived (30 minutes) and when we needed to leave (15 minutes). However, our drivers both times were extremely pleasant and we got to the airport on time so no harm no foul. When we arrived into Paris, it took almost 3 hours to get to our hotel because of the traffic, but that wasn't the driver's fault. The staff at our hotel told us there was a flat rate from the city to the airport via taxi. It would have been the same cost as the shuttle, but at least with a taxi you can call them when you want. I can't vouch for taxi service though because we didn't use a taxi at all the whole time. 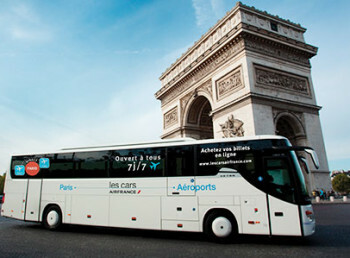 Another option is to use this Air France Bus Service (you don't have to fly Air France), it's about 10-20 euro depending on which airport you use and it will drop you off at a bigger train station (you can view the route map here), and then you catch the metro to the station closest to your hotel. We did a lot in Paris. A lot. I won't go over it all, but just what I recommend. Versailles. This was so amazing it got its own post. We did a bike tour and it was definitely one of our favourite days. I was a bit worried with so little time in Paris it would be silly to 'waste' a whole day at Versailles, but it was absolutely worth it. If you are short on time, I would still recommend a half day tour. You could do it on your own, but you're seriously better off getting something that includes a skip the line ticket because those lines are insane. I highly recommend Versailles. 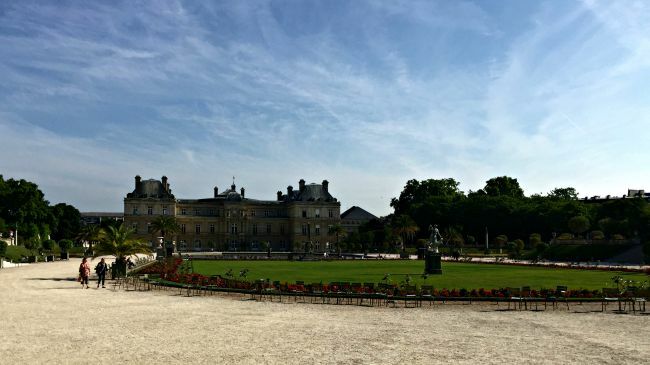 Luxembourg Gardens are absolutely beautiful and highly worth a few minutes of your time to wander through. 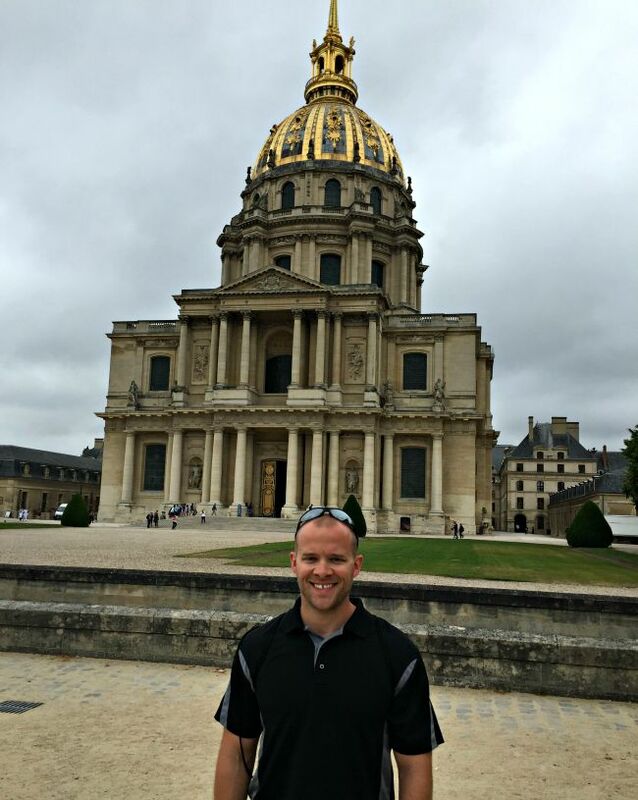 Hotel National des Invalides aka the Army Museum aka where Napoleon is buried. I'll be honest. I love museums, history and science especially. But war, army? Nope, no thank you. Not my jam. KC though? He talks smack about his time in the military but whenever we go to any kind of army museum he's like a kid in a candy store, so I knew he'd love this. I was not prepared for how much I would enjoy it though. Seriously. Okay, the Napoleon part? Eh. Sorry, I don't mean that in a disrespectful way, but the rest of the museum is much more interesting (it's actually kind of creepy when you think about the fact that Napoleon is like right there in that thing like right there isn't that weird?) and there was even this one part where there is a video of the liberation of Paris in 1944 during World War 2 that made both KC and I cry. I don't even think it was in English or had subtitles, but the scene was so emotional that I had to walk away because I was blubbering like a fool. Seriously. Highly recommend. Montmarte and Sacre Coeur is definitely a must see as well. It's a bit of a hike but the metro will get you there quickly. Sacre Coeur is beautiful and the area of Montmarte is so fun to walk around and just look at everything, taking everything in. However, I will say this is the only area were we encountered scammers. Walking up the hill to Sacre Coeur on both sides were groups of men blocking the way, trying to put bracelets on you and then demanding payment. They didn't just ask though, they grabbed at you. Like really grabbed at you. It was kind of annoying and ruined the experience a bit, but we just ran past them and tried to ignore them. We didn't encounter anything like this anywhere else, just here. Musee d'Orsay was the only art museum we went to - gasp, I know. But honestly, why pretend to like something you don't? We saw the outside of the Louvre, and that was enough for me. If you want to visit the Louvre, you do you. But I highly recommend you also visit Musee d'Orsay because it is gorgeous and has lots of interesting things to look at. I know I sound terribly uncultured, sorry about that. Champs Elysees, I don't care how touristy it is, it was fun. Lots of shops and things to eat and people to look at. I loved it. Montparnasse Tower was right near our hotel. I'm generalising, but it's just like going up the top of Rockefeller Plaza in NYC so you can have a beautiful view of NYC with the Empire State Building (which, unfortunately, we did not get) in it. I thought it was a much better idea to visit Montparnasse Tower and see the Eiffel Tower, than go up the Eiffel Tower and see Montparnasse Tower. Plus, it's cheaper. Plus, champagne. Oh, and you should probably visit the Eiffel Tower. But I feel like I don't need to tell you that, right? Well of course I need to talk about shops. I actually didn't shop too much in Paris, but of course I shopped a little. I did the most shopping on Champs Elysees. H&M mainly, because I'm boring like that. 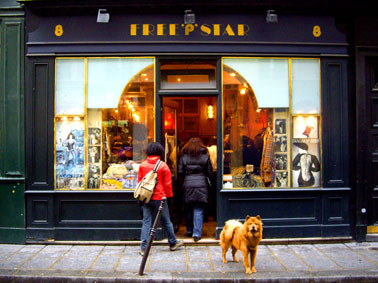 In Le Marais - another wonderful area to wander around, lots of good food and shops - I stumbled across a secondhand shop called Free'P'Star. It was jam packed with both people and clothes, but I managed to find a dress (that I might 'refashion') and a scarf for 20 euros. Not bad! Saving the best for last! Unfortunately, KC and I are not what you would call 'foodies'. We like our food to be good, and cheap. We are easily impressed, but picky, and not fancy at all. Macarons. Undeniably, one of the most popular foods when you think of Paris, right? I was so excited to try them. Unfortunately... nope. I could go the rest of my life without a macaron, sorry to say. 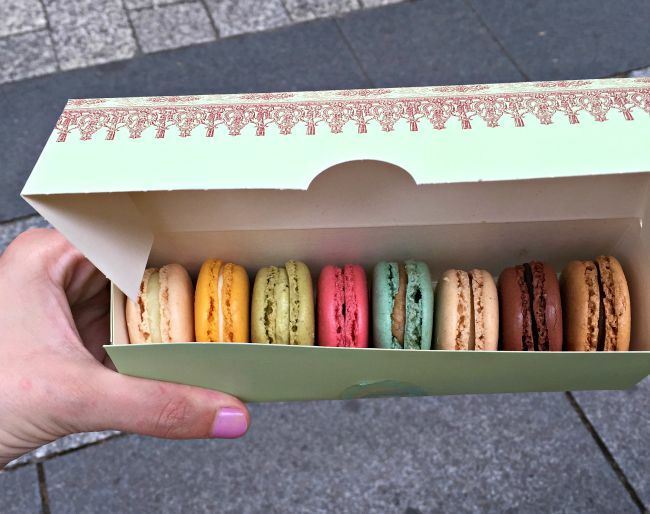 We tried Laduree and Pierre Herme and some little bakery near our hotel, you know, just to be sure. Nope, not a fan. That's okay. Pastries. Oh. My. Word. If I could go back and not eat anything else besides pastries, I would. The best part is that they are so cheap! Like, a euro. My favourites were the chocolate pastry, the apricot pastry, the croissant.. oh, who I am kidding, they were all my favourite. Oh and the tarts... SO good. Falafel at L'As du Fallafel. When I first saw this recommended on a blog, I was like.. haha no. I like falafel but in Paris? That's weird. But then I kept seeing it pop up. So I added it to our itinerary. It's in Le Marais, and KC was so hangry when he saw the line he wanted no part of it. I ignored him and stood in line, and less than a minute later we had food in our hands, no exaggeration. It was, without a doubt, the best falafel I have ever had and I couldn't finish mine, but KC gladly did. Bread, meat, fruit and cheese. Seriously, just get you some bread, meat, fruit and cheese and have a picnic. You really don't need to be fancy (unless you want to, of course). Another thing we ate several times were crepes, but of course, I ate them so fast - no pictures. Worst blogger ever, however I still highly recommend them and they are super cheap at the little street carts. The biggest surprise for us in Paris was the food was so cheap. Like, much cheaper than we were expecting. All of our meals were less than 10 euro each, and to me, that is cheap. It's a lot cheaper than what I budgeted. We had pizza a few times for dinner and even chinese food one night. But mainly pastries and bread. Mmm. I could live on that. 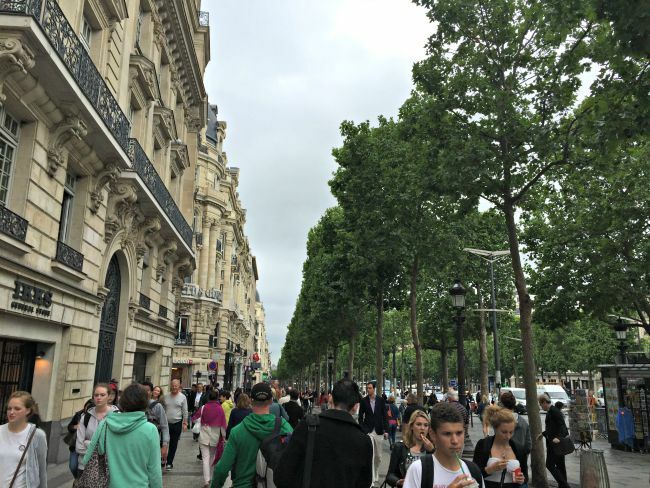 Like I said, this is certainly not a comprehensive list and I don't pretend that we did absolutely everything there is to do in Paris, but we did enjoy our time there very much and it was because of these things. 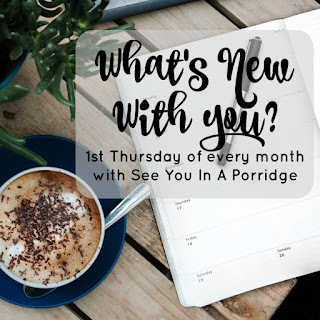 Did I leave anything out that you are curious about? Awesome review. And thanks for the hotel recommendation. 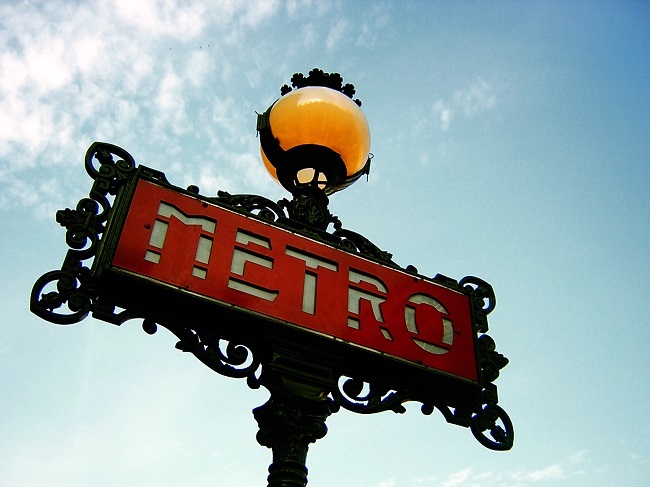 Finding proper accommodation in Paris is almost impossible! You are making me want to go back to Paris for sure! Love all your suggestions! We didn't experience anyone like that at the Sacre Coeur when we were there. That would have kinda ruined our experience too! i loved the musee de orsay too! i skipped the lourve the first time i went and just did that one. you hit all of the best spots. versaiiles is on my must-do next time. paris was so incredible!! 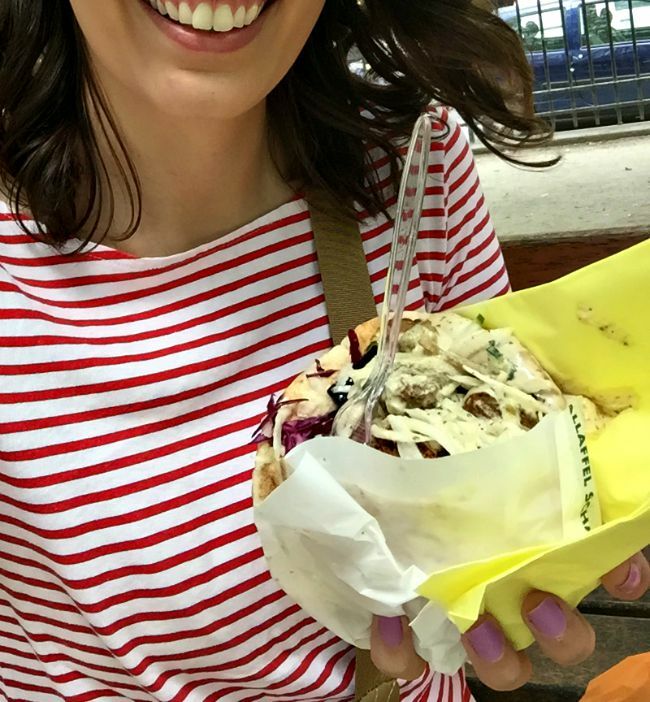 did you find any of those street crepe people who sell crepes the size of your face for like $5? when i went there (years ago), they sold amazing crepes of all kinds for $5francs. I had the same experience with the "gypsies" while climbing the hill to Sacre Couer! I was chaperoning a group of 30 high school students so my main concern was for them, not myself. Luckily, we had more boys than girls in our group and the guys really stepped up and protected the girls during the walk up. One gypsy tried to grab my arm as I hiked up the hill and as he did, I reflexively clinched my fist, drew my arm back ready to punch, and yelled "F*CK OFF!" He backed up, hands raised, and proceeded to call me every name in the book, as did some of his "associates." But, no one tried to touch me again so I was satisfied. We also had issues with the female gypsies around the Eiffel Tower and Notre Dame. They would wander around the crowd asking people if they spoke english and if you said yes, they would hand you an index card that revealed a sob story and how they needed money. If you refused to give them money, they would basically follow you around begging and a few tried even to pick some of our kids' pockets. After we caught on to their act, if anyone approached us and asked if we spoke english, we just stared at them and said nothing. They appeared very uncomfortable with our eye contact and usually left. Unfortunately, those experiences really tainted my Paris experience. I basically live on Trip Advisor when I am planning a trip, especially for the hotel. So far, (knock on wood), it hasn't disappointed me yet. All the food looks so delish! The whole bread/meat/cheese/fruit thing is something I often miss about being in Europe. I loved when I was in Germany & that was breakfast like every morning. I cannot wait to shove all the pastry things in my mouth there. Do you feel like your hotel was centrally located, or well positioned to what you were planning on doing, or both? I don't understand why people like macarons - I think they are disgusting. But look so pretty. I wish traveling didn't give me such anxiety. Even reading this & all the planning - I felt like a pillow was over my face. God I am so jealous!!! If I wasn't scared of flying and if only I saved my money.. I could take a trip over seas. I want to go to Ukraine though. I know, so stupid.. highly dangerous but if I am going to get on a damn plain, fly over big water, and survive... then I want to go to a scary place. Pripyat being the first place to go! Then I want to finish in Amsterdam!!!!! P.S. 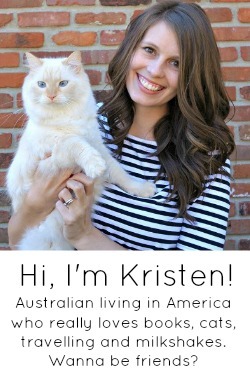 Would you be interested in guest posting on my blog about your trip??? I think it would be awesome! Ughhhh PARIS I MISS YOUUUUU. Wahhh. Great round up! And wasn't that falafel insane? I kept thinking it was so weird that everyone was talking about it....but omg yum! 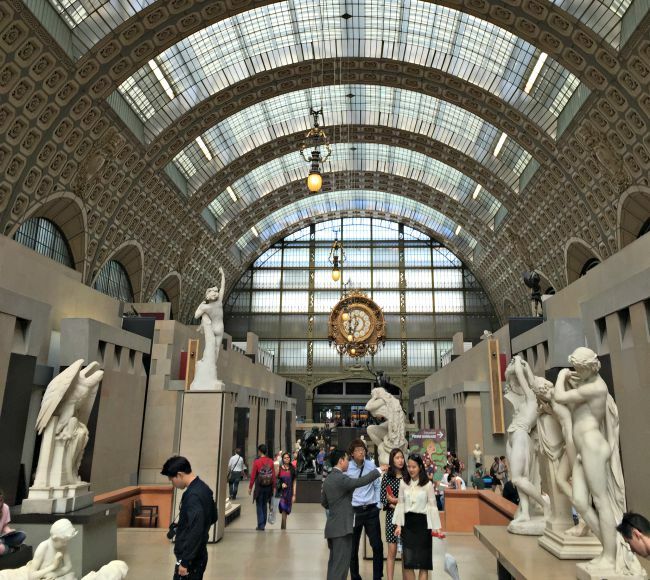 I don't think I could pick between the Musee d'Orsay and the Louvre, I'd have to do both. 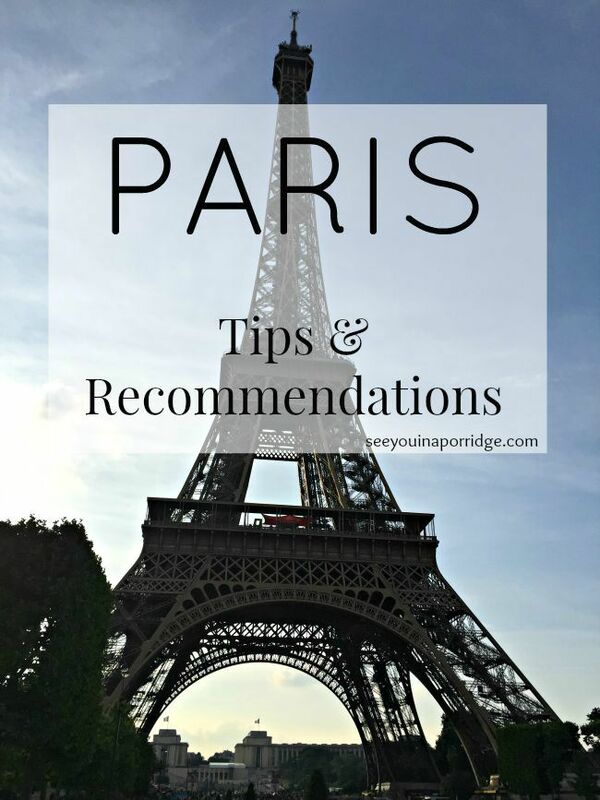 These posts keep moving Paris farther and farther up on my list :) I love yor recaps! All of the food!!! Is it sad that I really want to travel to other countries to experience food more than anything else? I mean of course I want to see all the pretty things like you mentioned above..but food is where the heart is haha! I have yet to have a macaroon. They are so pretty but I have a feeling I would be disappointed. I need to get on that. Crepes are delicious! And pastries....mmmmmm there is never a bad time for a pastry! These are FABULOUS tips. Not only is it always fun to read about what people do on vacation, these certainly have a practical element to them as well!!! You are giving me total travel fever again! Thank goodness for the dollar to euro conversion it makes traveling over there especially with the food somewhat affordable right now. Thanks for all these great tips! I would totally gain 50 pounds if I went to Paris. I would eat all the pastries lol. Great suggestions! The hotel sounds perfect! We like something comfortable but most importantly affordable because we prefer to spend the money on touring the city, food, drinks etc. You only really sleep in there right? Great little guide you put together. All the food looks amazing too! What an awesome post, so much good info!! I LOVED Versailles, so amazing! And yes, all of the food!! We ate so good in France! Such an informative and nice post. I loved the pictures as usual and the Macarons picture is making me hungry. I like clean and cheap hotels. I don't need for them to be super fancy! I'm with you -- when traveling a hotel is just a place to rest! The rest of the time should be spent exploring! And eating all the yummy food! Saving this for the day when I hopefully get to go! Your guides are the best! This made me want to go back to Paris so badly! I ate croissants around the clock! Seriously, how could you not? One of my favorite research tools before going on trips is other people's blogs. I love hearing what they did, where they stayed, and what they are. 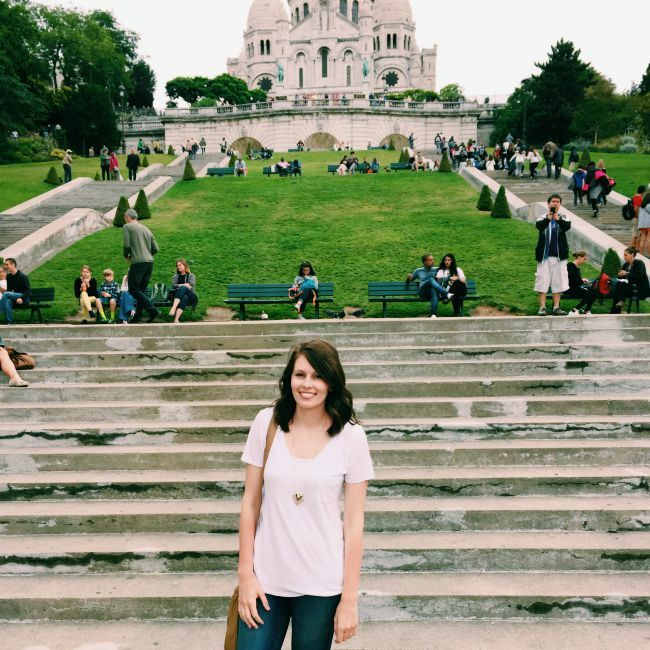 Thanks for putting all of your Paris recommendations into one post! I was getting ready to never speak to you again for not mentioning food... but then I got to the end. :D I can't believe you don't like macarons... I looooove them! They're hard to find nearby though!! So yeah. Totally saving this for a later day! I cannot wait to visit one day! It's funny that you mentioned not hitting The Louvre, because that was actually one of my favorite things in Paris! I know that art museums aren't everyone's thing, but even my husband loved it (and he's definitely not as into art as I am). Actually, he was a great sport during our entire trip to NYC/Amsterdam/Brussels/Bruges/Paris ... While we were in New York, I went on and on about how we had to go to at least one art museum (even though I'd already been to most of them). I dragged him to the MoMa (which is REALLY not everyone's thing! ), and he patiently walked around with me while I freaked out over de Chirico and Picasso and Dali and many more. I'm also surprised that you aren't a fan of macarons! I love them (and of course we had to get some while we were in Paris)! We were actually approached by a young girl with a ring trying a similar scam in the central part of the city. The picture I use as the main image on my blog was taken at one of the fountains in that area literally minutes before this chick started harassing us. Thankfully she wasn't overly aggressive. It was mostly just annoying because we felt like we needed to get the hell out of there (and fast!). Oh, and I think we must have eaten at the wrong places while we were there because we spent so much money on food! I would probably classify us as "foodies" (or, at the very least, "wannabe foodies"), though, so we spent quite a bit of money on food and drink in every city. That picnic looks like a lot of fun and delicious!! And I'm 100% with you - I went to Orsay and I adored it! I saw the outside of the Louvre and that was already enough for me! I always hear of people heading to the Louvre and running through the whole thing to try to catch a glimpse of the Mona Lisa and then bam it's time to leave...doesn't sound like fun to me! Yay thank you for this, so helpful! I think the getting around part is always what I worry about when visiting somewhere new. I'm like you and prefer to walk as much as possible! And as much as I love museums-- I don't blame you for only going to one. When you're somewhere with so much to see, sometimes you feel like you need to just rush through museums without being able to enjoy it. It was fun reading this after getting back! We actually bought the "tourist" metro card. It runs from Monday-Sunday and you can use it as many times as you need during your stay. We bought the version that included the airports (since they're in a different zone than most of the touristy things). Up the hill to Sacre Couer was the only place we got seriously hassled too - I told my friend that I would have smacked those guys with my water bottle if they had touched me, but they actually got their bracelets on her. We also got stopped by a child in the metro tunnel who was trying to scam us, which was a bit shocking, but also not uncommon. No pick pocketers though!